Summer Reading Challenges, We Love You! This post should be no surprise, as I’ve written about reading challenges through our local library before in this post (1000 Books Before Kindergarten) and this one too. We have since finished the 1000 Books program and kept right on reading every day with our kids. The Summer Reading Program is always so awesome, giving options for kids who are listeners and readers. At the half way point and again at the end, kids receive packets of coupons to so many family-friendly attractions. Plus for reading recommended authors, (a great way to discover new, good books), they are entered into a drawing. I just received an email saying that my daughter WON one of these drawings for a gift card to a local custard & burger joint. YES! Reading Challenges, we LOVE you! Finished – one of my kid’s reading logs for the summer reading program. By doing all of this reading, it has become a daily ritual in our home, in the car, at church…books seem to always be with my kids. We’ve received books for free from these programs, and thoroughly enjoy going to the library regularly to check out new books, participate in their many activities, or just play with toys that support early literacy. I feel very fortunate to live in a community with such a wonderful public library! It’s fun raising super readers! 800 Books Down – 200 to go! We are approaching the END of 1000 Books before Kindergarten! It’s felt like a long haul some times, but little by little, we’ve kept on reading to our kids and religiously filling out those reading logs. Front of the reading log in 1000 Books Before Kindergarten. The back includes the list we fill out (not as photogenic). Books that my kids picked out for their “listening” to so many stories. As I mentioned in the first post, I am into this program! I love the quite time that reading to my kids brings, and I hope to instill within them a love of books and reading. To my delight, I will find them snuggled up with books from time to time. Love seeing them snuggled into a chair together looking at books. In these pictures they were reading “old books” that had old book smell. As I wrote about in my Fly on the Wall post, my daughter asked if books took baths. For the record, they also partake in “wrestling” and do not simply sit quietly and read all day. What reading programs do you do with your kids? What are your favorite children’s books? We love reading together as a family! It’s my go-to activity to calm the kids (and myself). We are in the library’s 1000 Books Before Kindergarten, and are approaching 700 books read! Whoohoo! To read 1000 books in 1 year, you need to read 3 kids books a day – easy, right? With my daughter in 4k, we started receiving those awesome Scholastic flyers with good deals on books. Being a book-lover and frugal gal, I couldn’t resist buying a few books by Mo Willems (for less than the bookstore’s price) and this gem of a book for $1! 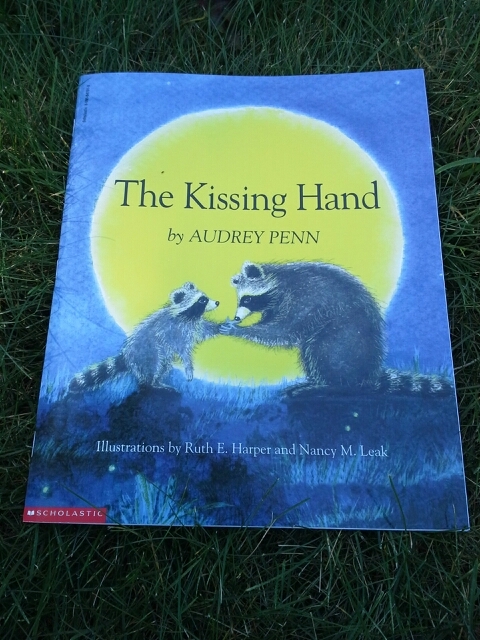 The Kissing Hand by Audrey Penn is such a beautiful story about a mom sending her little racoon off to school. She’s a clever mom (like we all try to be) who comes up with a way to help her son feel loved when he’s away at school. It’s so sweet and one of those books that makes me get a little choked up at the end! If you or your child is having separation anxiety, this is a wonderful book for you! We received a gem of a book from a family member recently. She remembered it from her own childhood and was happy to find it at a rummage sale. This book was worth every penny, as it is the source of lots of giggles in our house. How can any other book compete with that? So cute and fun to read with my kids as their giggles escape uncontrollably. Thank you so much for the fun book!! Have you seen this book before? On a slightly more advanced reading level, I have enjoyed Water for Elephants by Sara Gruen, Gone Girl by Gillian Flynn, and The Guernsey Literary and Potato Peel Pie Society by Mary Ann Shaffer. These are all books that sort of jump around time-wise and some change narrators. What book are you enjoying right now?